When Dr Ernest Walters and his research team are murdered in the Aguarico Parrot Preserve, news of the deaths has massive repercussions on the Earth Summit, held in the troubled Caribbean paradise of San Pimente. 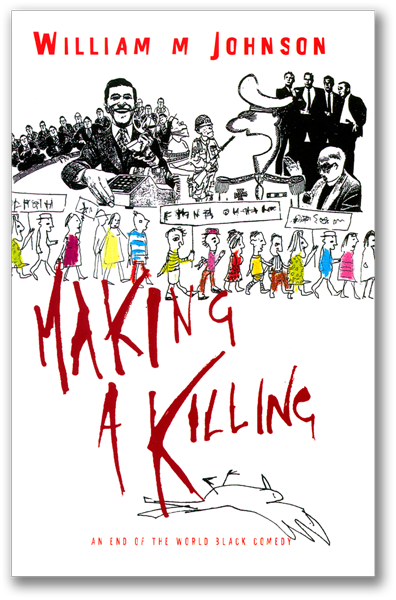 William M Johnson's critically-acclaimed satire, Making a Killing, has recently been republished by Iridescent Publishing as an Amazon Kindle ebook [http://www.amazon.com/dp/B0088CGHRM]. The publication marks the 20th anniversary of the Earth Summit (June 20-22), when some 50,000+ dignitaries, bureaucrats, scientists, nature managers, conservationists, business leaders, celebrities, and the world�s press will once again converge upon glamorous Rio de Janeiro for the UN�s "Rio+20" Earth Summit - billed as a 'once in a lifetime opportunity' to save the planet. With elephant-hunting royalty again in the news, nature managers insisting that endangered species must be made to pay for their own conservation, sea levels on the rise and deserts on the march, the frenetic political escapism, corporate wheeling and dealing, and media frenzy that Making a Killing flayed back in 1996, are if anything even more acute today - and just as deserving of this satire's poison-tipped pen. A conservation insider with 30 years' experience with some of the top names in international nature protection, William M Johnson's other published works include the non-fiction The Rose-Tinted Menagerie, an Observer Book of the Year, soon to be re-released by Iridescent.